For the discerning client that appreciates the differences top notch design, materials, and construction make. WELCOME BROWSERS: David Wixon & Associates was established by David Wixon, stained glass artist, as a full-time, full-service professional stained glass studio in suburban Chicago in 1982 and has served clients nationwide since then. In 2015 I moved my studio to Peoria, AZ, in suburban Phoenix from where I continue to be available to select residential and church clients. Please feel free to contact me with any question you may have or for more information about any of my custom stained and beveled glass and related products and services. I will be glad to work with you to achieve all of your objectives whether they are for distinctive and elegant residential glass, inspirational church windows, historic window restoration or any other creative art glass project. I invite you to see examples throughout this website of my company’s past and current projects and for ideas to help you plan your own project. We have served clients all across the United States and have established methods of planning, conducting and transporting your project so that no problem exists when you work with us if you are outside the Phoenix area. The most important decision you can make in the design, construction or restoration of your stained glass windows is the professional custom stained and beveled glass studio you choose to help you achieve your objectives so that your project will be the most appropriate for your particular circumstances. David Wixon & Associates, also known as Wixon Art Glass, has an excellent reputation for completing our projects to our client’s specifications, on budget and on time. All of this is done with a level of ethics, expertise and enthusiasm no other firm can surpass. I invite you to consider David Wixon & Associates your resource in stained glass to be used in any way we can be of use to you. You will find us helpful and glad to act as advisors to church window committees, architect, and interior designers or to homeowners directly. If you can imagine a style, message, mood or function in your home or church, David Wixon & Associates can enhance it for you with stained or beveled glass. 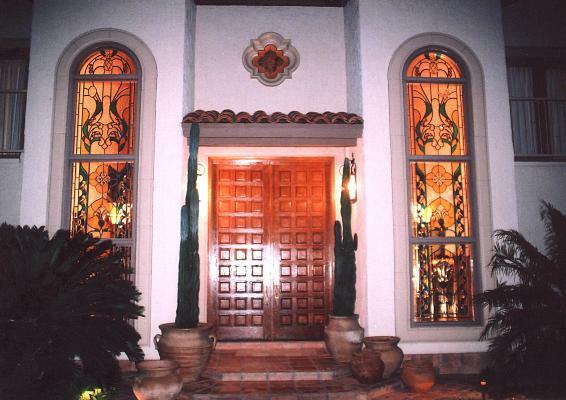 Contact me for an inspirational church window or custom stained glass and beveled glass doors, sidelights and transoms, grand entrances, bathroom windows, cabinet doors, stairway windows, and fancy skylights. I can help you achieve the look and feel of the fabulous life in your fine luxury home. For more information and for answers to common questions about stained glass be sure to review the various topics in the "Articles" section of this website.